A bezzel-ed out wrist isn't necessary, nor is it kind to your wallet. 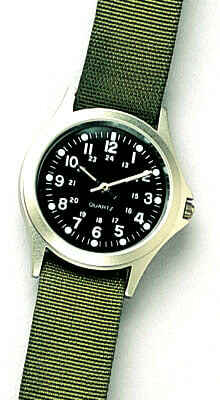 We aren't all blessed with P.Diddy's bank account (though we wish we were), so try a simple nylon strap watch. The field watch is an easy way to incorporate the military trend into your wardrobe, and you don't have to worry about anyone snatching your timepiece!